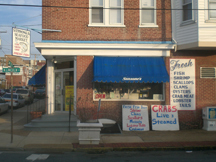 Sansone's Seafood Market, Wilmington's only specialty seafood market has been providing quality seafood to the greater Wilmington area since 1912. Offerings include shrimp, lobsters, oysters, crabs, and more. Shrimp, crabs, and lobsters freshly steamed and available for delivery. Sansone's offers full seafood catering, including crab parties, oyster parties, and custom party trays to suit any seafood tastes. Sansone's Seafood Market was founded in 1912 by James Sansone, who immigrated to the United States from Italy. Jimmy, as he was better known by his customers, brought quality seafood that could not be matched by the rise of the supermarkets, packaged foods, and TV dinners of the day. Today, Sansone's Seafood Market continues the tradition started by Jimmy Sansone - offering quality and service that can't be found anywhere else. Stop by Sansone's for fresh shrimp, crabs, and other seafood specialties and taste why there's nothing like the taste of fresh seafood.